Once again members of the Kentish Garden Club will open their beautiful gardens to the public. Whilst many of these gardens have been open before this is a wonderful opportunity to look at how the gardens have evolved over the course of 12 months. In addition to walking around these gardens visitors will be able to talk to the owners to get further inspiration, tips and tricks. This year’s “more than just gardens” trail includes produce for sale, light refreshments and a sausage sizzle, wandering minstrels, different types of artwork, artists painting, and even a scarecrow making demonstration. Activities will vary from garden to garden. All money raised from the Open Garden Trail will be donated to support the Leukemia Foundation, Cancer Council, and Appin Hall Children’s Foundation. We look forward to welcoming you at these gardens. “Rosnastraw”. It is hard to imagine that in just over ten years this garden has gone from paddocks with a few large Sycamores and Elms, to what it is today. The gardens specialise in roses in memory of Terrie & Noel’s son, Lee, who died from leukemia 8 years ago, and there are now over 3000 roses planted. Additionally there are a large number of rhododendrons, camellias, and flowering trees which provide the perfect backdrop. Later additions to the garden include a children’s play area, water features, and a number of whimsical creations in a naturally beautiful landscape. "Paloona Post". 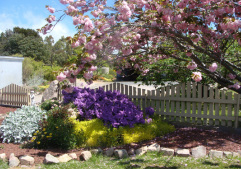 This garden is on the site of the original Paloona Post Office, hence the name. Covering around 2 acres in total, the gardens contain a fernery, many established deciduous trees, exotic and native plants, and a large vegetable garden. 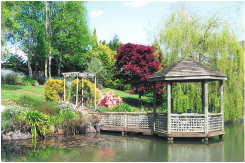 However, one of the key features of this garden is the stunning lake. Paths meander throughout this informal garden, leading visitors on a journey of discovery. “Badgers Springs”. This property provided the current owners a blank canvas when they arrived several years ago from South Australia – there was literally only a house and garage on a bare hillside. The primary goal was self-sufficiency in fruit and vegetables, and today this bountiful garden boasts espaliered heritage fruit trees and raised garden beds. A passion for native and ornamental plants has resulted in an eclectic mix of roses, clematis and ornamental trees, as well as native trees and shrubs that provide food, shelter and sanctuary for native birds. Of special interest is the floppy top animal-proof fence that really does work! "Big Bend Ridge". Set on a large sloping block, this lovely informal garden has a variety of annuals, perennials and variegated plants of many textures and colours. Jenny and David have used both native and exotic plantings to provide colour and foliage for most of the year. The garden also features a very productive vegetable patch.